In the last few weeks since my honeymoon, I have assembled and pinned a ridiculous number of models, especially considering how much work I have to do these days. 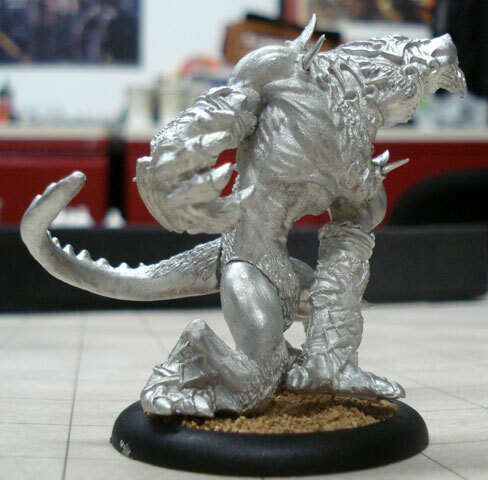 I had to prepare for a 15-point Tooth-n-Claw/Mangled Metal tournament the week I got back, so I assembled the Feral and the Pureblood (and eKaya and Laris, whom I did not pin). I had endless difficulty getting the pin holes to match on these models, in fact one of the Feral arms was drilled three times to get it to align, and the tails were an anatomically-appropriate pain. The Pureblood came together somehow in a way that the front arm doesn’t reach the ground, so I will have to re-base him, but I just wanted to finish by that point so I could play in the tournament. His legs don't go all the way to the ground. After that I discovered that next month’s tournament will be a 25-point Steamroller event, and I wanted to try eKrueger since I have had some trouble with ranged forces. I assembled and pinned eKrueger, the Gnarlhorn (drilled through the left arm socket into the kneck hole, so I’ll have to Miliput that), the Ravager Whitemane, an Argus, and the Druids of Orboros–all of the druids are pinned except the designated leader model, since I didn’t think I could drill deep enough into the hands to matter. Krueger required me to drill the right arm twice to get an aligned pin, and the arm came loose going in and out of the foam on a single round trip to the FLGS; I hope the latest glue holds, not sure where to go from there if it doesn’t. After this I wanted to assemble one set of my Warpborn Skinwalkers. I got one hand pinned, tried and failed to pin another, and couldn’t figure out how to pin the bodies. After some investigation into cementing with Miliput in the bodies, I got impatient and just scored the metal and superglued the bodies, arms, and heads. I am sure I will pay for my impatience, so I will wait to see how they hold up going in and out of the foam as well as on the table before I basecoat them. Have you seen our pitchforks and torches? Finally, after two weeks of sticking my fingers together with glue, developing a significantly intimate relationship with my pin vise, and several trips to the Internets to learn new swear words, I felt the need to paint. On Monday we are starting a new D&D campaign, and I am resurrecting my Swordmage character from my old San Diego gaming group. I had a basecoated model for this since March or so, and the clock was ticking, so I am going quickly and am not doing him as a real “showcase” paint job. I painted the cloth parts first, and then did a first coat of various browns. Next I applied a liberal coat of Devlan Mud to the various browns. Tomorrow I will highlight the browns, wash again, add a final highlight, then finish of the detailing. 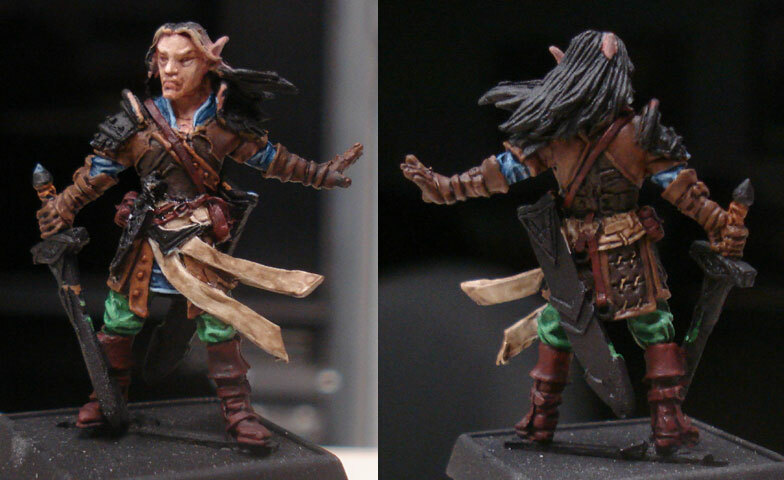 A technique I discovered while painting Baldur is to highlight brown leather only with the base color of the leather, instead of with a lighter color. 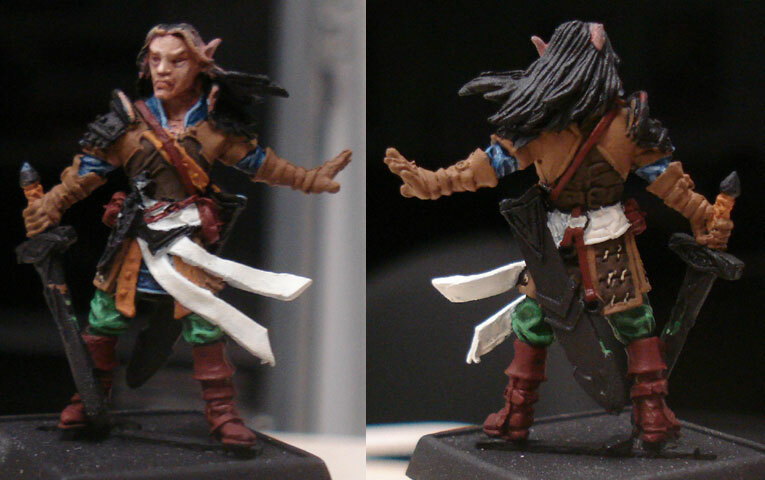 That reads more as leather to my eye than making a lightened version of the base color. I found a tutorial on painting leather online, but it didn’t help me, I’m afraid.